Wooden Handwork/Wooden Carpentry – I.A.M. 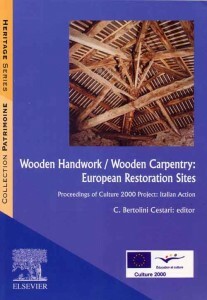 The book is organised into four sections and in the first part the methodological aspects of the European Project “Wooden Handwork /Wooden Carpentry: European Restoration Sites” inside the frame of Culture 2000 Programme are described with the intention to promote and encourage the comparison and integration of cultures between the different European countries. The other three sections collect the contributions of major experts of nine partner countries grouped according to the geographical areas: Northern Europe, Central Europe and Mediterranean Basin. The text intends to be a source of documentation and confrontation for architects, engineers, experts in the sector of constructions, public and private sector for the management of cultural heritage (i.e. National Boards of Cultural Heritage, Ministry of Cultural Heritage) and for everyone working in the didactic and research fields.